Oddball Stocks: M&F Bancorp at 30% of TBV what's not to like? M&F Bancorp at 30% of TBV what's not to like? I know myself; in my pursuit of perfect I miss what's good. This happened to me when I looked at Japanese net-nets. I wanted to find the best net-nets. The net-nets that were the greatest companies, yet also the absolute cheapest. What happened? As I pushed numbers around in a spreadsheet the market rose and I didn't participate as much as I would have liked. There were many good net-nets that I wish I would have owned. The good net-nets did as well as the great net-nets. It seems like there is always a country that's selling at a low multiple, or a sector of the market selling with depressed valuations. The areas of concentrated low valuations are what I consider pockets of value. These pockets of value need to be mined quickly before they disappear. There can be issues with this approach. Critics always have a myriad of reasons to avoid these pockets, many of the reasons are compelling if not convincing. Second mining pockets of value can result in a portfolio that's heavily concentrated in a hated area of the market. It's a tough sell for clients when all they see on CNBC are dire predictions about a portion of the market you're concentrating their portfolio in. Financials were one such pocket of value coming out of the financial crisis. Most of the surviving financials are much better capitalized, and should do well going forward. Some of the larger financials are still cheap, but that pool of opportunity is quickly shrinking. As larger financials have drifted higher they've pulled small bank stocks up with them. It's almost as if investors cycle out of larger stocks into smaller and cheaper stocks. Then when those small bank stocks rise investors go even cheaper. What we're left with is around 100 or so banks selling below book value. M&F Bancorp (MFBP) is one of those banks selling for less than book value, quite a bit less. The letters in the bank's name stand for Mechanics and Farmers, which is also the name of their bank subsidiary. The bank is located in North Carolina and has seven branches located in the major metropolitan areas of Charlotte, Raleigh, Durham and Winston-Salem. On the bank's website they have a page describing their corporate mission. The bank's mission contains 13 things they are focused on, the last bullet point is profits. This is a fitting placement, the bank is profitable, but they clearly aren't working to squeeze profits from anything possible. The bank is profitable and trades for about 8x earnings, and while that's nice what's even better is their discount to book value. The bank has a market cap of $7.6m against tangible common equity of $24m and a book value of $36m. They bank is selling for 30% of their TCE which is low, especially for a profitable bank. I mentioned in a previous post that I try to break an investment thesis down to a few simple pivot points. We first need to ascertain whether M&F Bancorp is on the edge of extinction, if they aren't then we can proceed to establish a value for them. There are two interrelated things that can kill a bank quickly, bad lending and too much leverage. A bank can operate through good years with a lot of leverage if they don't engage in reckless lending. Bad lending will destroy any bank, and it'll destroy banks with a low capital cushion much quicker. A bank with a higher capital cushion can weather a bigger storm, but if enough of their loans are bad the bank will eventually be taken over by the FDIC. In the case of M&F Bancorp much of their depressed valuation can be traced to their lending quality. The above picture shows the holding company's asset quality statistics for the last six semesters. Non-performing assets as a percentage of total assets were at the elevated level of 6.22% in 2011. In general I try to avoid investing in banks with NPA/Assets much higher than 3%. Although exceptions can be made, especially when the bank's portfolio is moving from troubled to normalized. The company's problem loans peaked at 8.09% of total loans in 2010. 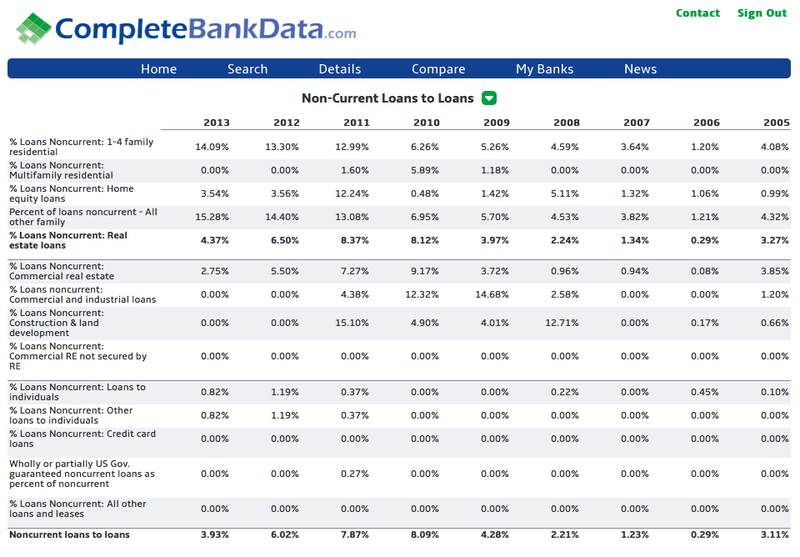 I dug further into the bank's loan portfolio to determine where they struggled with lending. It's not uncommon for a bank's non-performing assets to spike if one or two of their large commercial loans run into issues. Commercial loans are riskier than residential loans, and if business conditions are difficult it's not unusual for a company to default or defer interest on a loan. Business loans are larger than residential loans as well. A business might need to finance a million dollars for expansion, whereas a million dollar residential loan is rare. M&F Bancorp's lending issues weren't related to commercial lending, they were with real estate loans unrelated to individual borrowers. The details of their actual issues aren't public, but it looks like they might have done a lot of lending for multi-family residences which ended up facing issues. The loans never went bad, they were eventually restructured and the loans are now performing. The bank has been continuously profitable for the past nine years, and coupled with the sizable capital cushion of 10% core capital, and 15% Tier 1 I think we can safely establish that the bank isn't going out of business any time soon. And with their loan portfolio under control they aren't heading for a capital injecting anytime soon either. With that we've established the first pivot point for this investment, that they are a viable company and should continue as a going concern. The second task is figuring out what they're worth. This is a much simpler task. My general rule of thumb is that a profitable bank with an average loan portfolio should be worth at least book value. When I first started writing about banks I was taken to task over this presumption. I received comments and emails justifying why 50% of book value is a fair value for a profitable bank. I still disagree with that assessment, and the market does as well. As I mentioned above the pool of banks selling for less than 1x book value is quickly shrinking. Secondly the bank M&A market seems to be firmly established around the 1.5x TBV metric for acquisitions. The great news is that M&F Bancorp is selling at such a depressed valuation that even if it were only worth 50% of TBV that would mean a 50% gain for investors buying at current levels. I suspect that this bank is worth much more than 50% of TBV, but to get the numbers to work we don't need an optimistic scenario. If you're interested in seeing how CompleteBankData.com can simplify your bank research, or help you find profitable bank investments sign up for a trial and see for yourself. 12% up; pump and dump Nate? Maybe you didn't quite make it to the end of the post, the part where I said I think this is worth a LOT more than where it's trading now. No intent on pumping this, I purchased this a while back at a higher price. I'm not selling anything either. I'm not in the business of taking advantage of readers like you're accusing me of. I debated even publishing this comment, it adds zero value. If you're interested in buying I'd be willing to bet shares will trade lower than today in a few weeks, they always do. I'm sorry that your perception of me is someone with bad intentions. It seems as readership as grown there is now always someone, maybe you who posts these comments anytime a stock I write about appreciates. My policy going forward will be to remove comments that add zero value to the conversation and who's only purpose is to attack me. You're free to think whatever you want about me, but if you have such a negative view I wonder why you continue to read the blog? How did you determine that the company trades at 8x's earnings? Its seems like after you subtract for preferred stock, the earnings are minimal. Yes, this is an error, I was looking at the profit as reported to the Federal Reserve, not from their 10-K. Thanks Nate. Keep up the good work. The bank is barely profitable after the div for the preferreds. The main question in my mind, will loans increase enough that profitability is better over the next few years? The bank is not currently earning its cost of capital, hence a discount. At 30% of TBV, the discount is too much. If profitability can increase, MFBP can re-rate to 100% of TBV (or higher). Otherwise it probably goes to 50-75%. Buying shares this cheap, your margin of safety is huge. Sometimes this is a patience game as MFBP could lie dormant for a year or two and then the re-rate can happen all in the span of a few weeks. Preferred is paying 2% div so MFBP probably wouldn't buy them back until the rate step-up. "Under the CPP, the Series A Preferred Stock carried a dividend rate of 5% for the first five years after issuance, after which the dividend rate increased to 9% until such time as the Series A Preferred Stock is repurchased or redeemed. Under the CDCI, the Series B Preferred Stock carries a dividend rate of 2% for eight years, after which time the dividend rate increases to 9% until the Series B Preferred Stock is repurchased or redeemed. The Company paid all of the dividends due on the Series A Preferred Stock up to the date of closing of the CDCI exchange on August 20, 2010, and is current in its payment of dividends on the Series B Preferred Stock." What do you think of the management that created this NPL mess? Isn't there a high risk that the (same) management will repeat history by relaxing underwriting standards, especially considering everyone is searching for yield. I guess you could apply the same blanket statement to all banks that had troubled loans in the crisis. Or really any company that hit a rough patch. My experience has been that no one knows the future, and in retrospect some decisions do look stupid and were. But there are other decisions that can end in bad outcomes that look perfectly acceptable at the time. I tend to give management the benefit of the doubt. There's also the second consideration that regulators are taking a closer look at loan books and some of the lending that was allowed in the past isn't allowed now. Wow, this is the first time I've seen such a colorful annual report from such a micro-cap company! I recalled somewhere someone (probably Brooklyn Investor) saying a bank is worth book value if it earns 10% on equity. Quick look at Morningstar shows M&F earns around 1-2% return on equity. Maybe that's the reason for the low valuation? Anyways, good stuff as always Nate. Thanks for sharing your thoughts! Investors have all sorts of heuristics on what a bank is worth. I just posted a new post on how I view the intrinsic value of a bank. In short, I disagree with the 10% ROE required for BV, and it seems the market does as well. MFBP looks like a nice recovery play. I think the huge discount to book represents a good margin of safety and i think I will buy some shares, if it settles down again. I own a similar bugger - CZBS, which operates roughly in the same area, I think, also very illiquid. Usually, I prefer well managed banks like LGHT or OVLY and I am willing to pay small premiums to tangible book if there is growth, decent profitability and a clean loan book. There are many ways to skin the cat when it comes to community bank stocks. Thanks for sharing. Here is some related news, insider recently bought 1000 shares. Yes, I saw the insider purchases as I was research this. I debated on putting them in the post and decided against it. It's another factor that increases the validity of the investment thesis, but at 30% of TBV I thought it was cheap enough that I didn't need to pile on. Man, extremely volatile the last two days. Up to $5 yesterday, down to a little above $4 today. What's going on? I think you're just seeing what happens with small stocks. Selling isn't rational at all, why would someone sell at $4 when the price was $5 a day before? I have no idea, but things like that should be viewed as opportunity. I looked at this one a year ago and passed due to the risk in the loan book. Almost half of their loans are to churches and just over 10% are residential firsts. Almost 20% of the church loans are considered impaired as of 12/31/13. It's not like one can reposses a church and turn around a sell it promptly and for a value near its cost. Demographically speaking, church attendance and revenue have both been flat to down in each of the past ten years. This is not a growing segment which only compounds the risks of these loans. You also need to segregate out the preferred when not only calculating TBV but also equity-to-assets. The common is $24.4mm and equity-to-assets is just 8.4% when backing out the preferred and the assets attributable to extinguishing the preferred. With over $26mm of impaired loans currently it doesn't take much to put the common in a very bad place. With 66% of their loans outstanding coming due within one year (80% for churches) -- similar to last year -- it indicates that the borrowers are living off of low-cost short-term financing which requires rolling it every year. If/when short-term rates rise, the borrower's interest burden will become materially greater and refinancing will become more challenging. Those 20% of church loans that are impaired will likely not fare well in that environment. All that said, there is a decent probability this thing makes investors money from here due to its valuation. But there is a lot of risk -- a lot more than you can find in similarly valued small banks. That's why I passed last year -- I found banks with just as low valuations that had higher quality loan books, capital, demographics, and management where the risk of total loss was much lower. Thanks for the comments, I appreciate them. I'm not sure if churches are good or bad credits. I'd like to think they're good, but I'm not sure. In some ways they're flexible. A churches congregation has the ability to increase their giving which could bring a loan current if they hit a rough patch. On the TCE/equity point, I agree and disagree. I used TCE subtracting out preferred when discussing the value of the bank. But I think it's very appropriate to use full equity when looking at equity to assets. Your point is that shareholders margin of being wiped out is much slimmer, which is what I agree with. My counter point would be that the regulator is looking at their entire equity ratio, their tier one capital which includes preferreds. The regulator is going to step in and force a capital raise before shareholders are imperiled. If they're at 15% right now, and if that fell by half they're going to receive a consent order and be forced to correct their problems. But your final point is what rings true. This clearly isn't a perfect bank, it has problems and at 75% of TBV I would have passed, but its valuation is far too low. Ultimately valuation trumps most other things. I can overlook a lot of issues due to the price here. I'm hoping to have another post out early next week on this issue. No strong view on M&F but thought I pass along some info on their unstated bank premises. I think you should add the difference to TBV. Also, 6M office building isn't exactly necessarily to operate the business. Anyway, just thought I pass this along. This is a hidden secret of banks, usually their branches are valuable but held on the books at or close to nothing. Indeed. They are renting out a portion of that large building on 15-501, which I would imagine is pretty valuable real estate since it is the only road that connects Durham and Chapel Hill. I love your blog. This is a cool site and I wanted to post a little note to tell you, good job! Best wishes!!! I make a living investing in asset-value small caps, mostly in the UK. I've been reading your blog for a couple of years and always enjoy your suggestions. Thank you. Don't be put off by the flack. Thinking and reasoning always upsets a minority who are poor at both. Anyone who develops expertise and an independent view is likely to be in the firing line - in inestment and other fields. It's a badge of achievement. Wear it proudly. still the cheapest bank on the planet? time for an update? Wow! It's very adorable. For both little and big churches, church financing in USA requirement fulfilling facilities are available. Really? That's great. The most accurate recommended church loan in USA are recommended by the most expert and efficient lenders there. Griffin Church Loans is the best one therefore in USA. What's the worst case scenario?